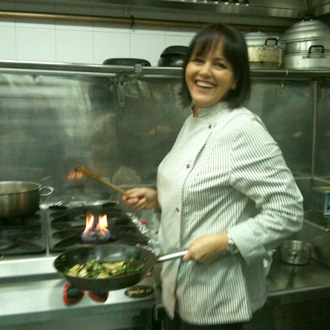 The first thing you notice about Chef María José san Román is her infectious enthusiasm for all things culinary. A world-class chef with six restaurants in Alicante, including the Michelin-starred Monastrell and another recently rated Best Tapas Bar in Spain (obviously no small feat), san Román is best known as the Queen of Saffron. She has embraced the essence of spices native to Spain in her culinary creations, so it is no surprise that her most recent obsession is olive oil. She is the first to admit that she is “just a beginner” when it comes to understanding the magic of olive oil when married with other ingredients in her repertoire. But the industry could not have a more inventive student. The January opening of her own Oleoteca olive oil tasting program was celebrated with a 12-course meal, each dish featuring a different olive oil. An active partner in introducing the value of high-quality olive oil to chefs worldwide, she was on hand for the recent award ceremony at Madridfusion Congress 2012 where the Oleoteca OliveToLive serving system received the prestigious technology innovation award. For Spaniards, olive oil is a kitchen fundamental. I have been a devoted user both at home and in my businesses all my life. But it was not until the past few years that I became so truly aware of all the ways that particular olive oil varietals can change the whole flavor of a dish. My professional involvement with the industry began when promoting Spanish olive oil in Cordoba over six years ago. Along with colleagues from the Culinary Institute of America, we made a video from the almazara (olive mill) on a finca (ranch) in the region. Some years later, I took part in the Beyond Extra Virgin Congress in Verona, Italy. It was amazing how important the selection of different types of olive oil could be to the ultimate taste of different dishes. In other words, I love the challenge of finding the perfect marriage of olive oil and food. Finding a way to let everyone have the opportunity to taste olive oil in its best condition and learning about different qualities and varieties. It looks easy but, in reality, there is a lack of knowledge about the product and it is rare to find people knowledgeable enough to teach others. This does not happen in the world of wine where most people can appreciate any fault with quality or know the type of wine. Almost anyone can tell a Riesling from a Chardonnay. The fact that this product comes from the country where I was born and raised and is a part of my culture. For this reason, I feel comfortable with olive oil and want to help to promote it around the world. The best part, the most fun, is finding just the right combination of a particular olive oil and food that takes the dish to a whole new dimension. So, I’m working to improve the pairing of difference varieties of olive oil with my recipes and other products. I have discovered an inexhaustible source of culinary ideas with one of the oldest products of our Mediterranean diet. A hamlet in Asturias, in the north of Spain, where my mother was born and where I spent many happy holidays in my childhood. Spanish producer, Castillo de Canena makes a beautiful Picual olive oil that I love to use in my olive oil and saffron cake. It is hard to believe that the bitter, piquant taste of the Picual olive disappears in the mix and becomes more delicate, but it adds such depth of flavor to the cake. To have managed to be surrounded by my family both in my home life and in my businesses. El Bulli, 1st August 2010. Indescribable! Five hours in heaven! To launch the Oleoteca OilToLive project together with Paolo Pasquali, its creator. It is a dedicated way to present the highest quality olive oil to restaurant customers and introduce chefs to the possibility that olive oil has its own special role on a menu. The whole system will revolutionize this industry for the consumer and I feel very happy and enthusiastic to be part of this project.